CCHS soccer standout Sebastian Novoa, right, makes a pass to teammate Alex Higgins during the Lions’ 3-2 victory over visiting Jackson County Thursday (April 7). Novoa scored two goals, including the game winner. (TONY STINNETT photo). 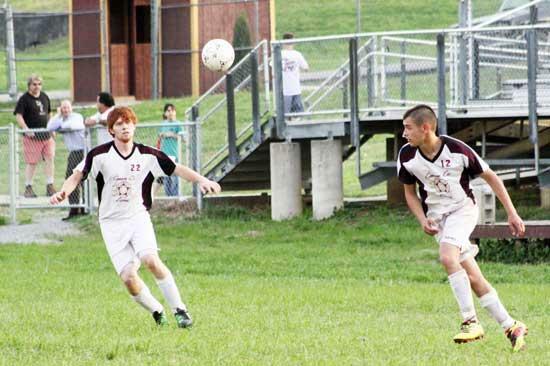 Sebastian Novoa supplied the offense and Damon Collette was outstanding in goal to help lead Cannon County to a come-from-behind 3-2 win against visiting Jackson County Thursday (April 8). Novoa scored two second-half goals, including the game winner in the waning minutes, to key the victory. Damian Coombs also scored his second goal of the season to help key the win. "It was a good win for us and the team, as a whole, is starting to come together and play better," Cannon County Head Coach Shannon Gannon said. "Sebastian came away with two big goals and Damian (Coombs) also had a huge goal to even the match. We were not as good as we need to be defensively and that created a lot of tough situations for Collette in goal but he rose to the challenge and came up big for the team." Jackson County maintained a 1-0 lead at the half after dodging several Cannon County scoring chances. The Lions (2-2-1) didn't misfire often in the second half. Novoa's goal three minutes into the second half tied the score, 1-1, and seemed to spark the Lions; however, Jackson County came back minutes later to regain a 2-1 lead. Coombs' rifled the ball past Jackson County's keeper on a penalty kick midway through the second half to even the score 2-2. It remained deadlocked until late in the match when, with time becoming a concern, Novoa came up with his biggest goal of the season when he supplied the game winner. The win may have not been possible if not for the outstanding defensive play turned in by Collette in goal. The junior was under attack throughout but consistently came away with one big play after another to turn back numerous Jackson County scoring bids on the way to his 13-save performance. "It's always good to feel like you contribute to the team's win," Collette said. "It was a close match so we needed to those stops, and I was just glad to be in position to come through." The Lions have home matches against York Tuesday and against rival DeKalb County Thursday. Sebastian Novoa scored Cannon County's only goal in a 7-1 setback to Friendship Christian, April 1. Kurtis Dryden scored Cannon County's only goal and Damon Collette was stingy in goal to help the Lions play to a 1-1 tie in league play, March 28. Devin Hill scored three goals and Damian Coombs, Wesley Alexander and Austin Higgins each scored one as Cannon County rolled to a 6-0 blanking of Bledsoe County, March 17. Damon Collette recorded the shutout.